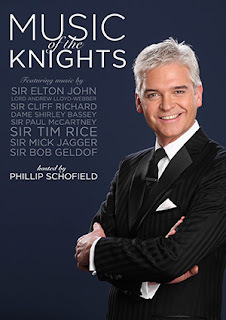 Phillip Schofield is to host new Music of the Knights UK concert tour in April 2016. He currently presents ITV's This Morning , All Star Mr & Mrs and The Cube Game Show and previously starred in Joseph and the Amazing Technicolor Dreamcoat at the London Palladium as well as the UK tour of Dr Dolittle. He says: "I'm so thrilled to be hosting Music of the Knights. It promises to be a great night of music and surprises. It's been quite a while since I've appeared on stage so I'm really looking forward to a great evening." Music of the Knights is described as a celebration of the legendary Knights of the entertainment industry who have transformed the face of music, film and theatre throughout the ages.The Knights include: Sir Elton John, Lord Andrew Lloyd-Webber, Sir Cliff Richard, Dame Shirley Bassey, Sir Paul McCartney and The Beatles, Sir Cameron Mackintosh, Sir Tim Rice, Sir Mick Jagger, Sir Bob Geldof, Bono and Sir Van Morrison. It will star some top West End stars accompanied by a live band performing musical numbers including: ‘I’m Still Standing’, ‘Rocket Man’ (Elton John), ‘Twist And Shout’, ‘Hey Jude’ (The Beatles), ‘I Dreamed A Dream’ (Les Miserables), ‘Do You Want To Dance’ (Cliff Richard), ‘It’s Not Unusual’ (Tom Jones), ‘Close Every Door’ (Joseph) and ‘Satisfaction’ (Mick Jagger).